Harold Bailey was born on 1st of January 1894, the eldest of at least seven children born to George and Sarah Ann (née Marshall) Bailey, who lived at 6 Evelyn Street, Beeston1. Harold, like most young lads from the area, attended the Nether Street School. The Boys Brigade register shows that he enlisted there on 18th June 1909, aged 15 and was then working at Beeston Foundry.2. Two other Boys Brigade lads who enlisted around that time, worked with him - George Simpson of Cross Street and Thomas Glover the last member of the 17th Company Boys Brigade to be killed in the Great War. The 45th Battalion left for England in March 1916, arriving at Liverpool on the 25th with a compliment of 38 officers and 1119 other ranks. In England, the 45th was broken up to reinforce the Canadian Corps and, in July, became part of the 11th Reserve Battalion which, in turn, provided reinforcements to the 16th, 27th and 43rd Battalions in France. Harold was eventually assigned to the 27th. Before being sent to France and Belgium, the battalion continued to train in southern England, during which time, it appears, Harold married Edith Annie Humphreys3. Canadian Infantry Battalions - When Great Britain accepted Canada's offer to send an infantry division on August 6th 1914, it was expected that it would be comprised of some of the 60,000 members of the Canadian militia. 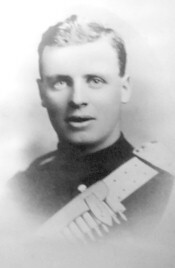 Instead Colonel Sam Hughes, Minister of Militia and Defence 1911-1916 decided to organize volunteers into new consecutively-numbered battalions. The First Contingent of the Canadian Expeditionary Force, which sailed on October 3rd 1914, was comprised of the 1st to 17th battalions plus the Princess Patricia's Canadian Light Infantry. By the end of the war there would be two hundred and sixty numbered battalions in existence. 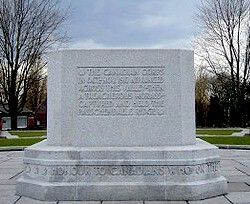 Shortly after the First Contingent left for England, the Government of Canada authorized the recruiting of a second contingent. During the winter of 1914-1915 the units composing this new force were mobilized and trained. In the spring of 1915 the Second Contingent sailed for England, but instead of sailing in a great armada like the First Contingent they left in separate transports. The summer of 1915 was spent in training at Shorncliffe on the coast of Kent and in September they left for the front as the Second Canadian Division. The 23rd and 30th Battalions remained behind in England as reserves. As we have seen with the 45th Battalion, this pattern of reinforcement continued during the remainder of the war. The Second Battle of Passchendaele - The Second Battle of Passchendaele was the culminating and final attack of the Third Battle of Ypres during World War I. The battle took place in the Ypres Salient area of the Western Front, in and around the Belgian town of Passchendaele, between 26 October 1917 and 10 November 1917. 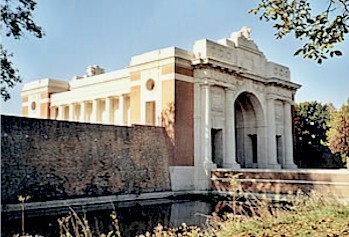 The Canadian Corps was tasked with relieving the exhausted II Anzac Corps, continuing the advance started with the First Battle of Passchendaele and ultimately capturing the town of Passchendaele itself. In the low ground west of the Passchendaele Ridge, three months of constant shelling had blocked the watercourses that normally provided drainage. When rain began falling, the battlefield was transformed into a quagmire of mud, making movement extremely difficult. The mud was to become one of the defining features of the battle for soldiers on both sides, and did a great deal to hamper offensive operations. The Canadian Corps operation was executed in series of three attacks each with limited objectives, delivered at intervals of three or more days. The execution dates of the phases were tentatively given as 26 October, 30 October and 6 November, with a smaller action later executed on 10 November. The attack was successful in capturing the German-held high ground along the Passchendaele-Westrozebeke ridge but the campaign was forced to end just short of Westrozebeke itself. The Second Battle of Passchendaele cost the Canadian Corps 15,654 casualties with over 4,000 dead, in 16 days of fighting. Nine Victoria Crosses, the highest military decoration for valour awarded to British and Commonwealth forces, were awarded to Canadians for actions during the battle. 1In the 1901 census the family is recorded at 26 Union Street, Beeston (Piece 3153 Folio 107). George, who was born in Somerset and was then working as a foundry pipe tester, had married Sarah Ann in 1892 in Lenton, Notts. Their children, all born in Beeston, are then recorded as Harold (7), Percy (3), Colin (2) and George (10 months). Three more children had been added to the family by the time of the 1911 Census - Bertha (about 1902), Gladys (about 1903) and Horace (about 1906). George, the son born about 1900, died as an infant. 2However, based on his later work as a joiner, as declared when he arrived in Canada, it appears that he worked in that trade at some time. 3The record of Harold's arrival in Canada survives on the ship's manifest. Here, he declared his occupation in England as "Joiner" but with an intention to seek farm work in Canada. A note on the document possibly reads "To Uncles Farm"
4Soldiers of the First World War (1914-1918). Library and Archives Canada, Ottawa, Canada. This document records Harold as Unmarried and his occcupation as Carpenter. He names his father at the Evelyn Street address as his next-of-kin. 5The CWGC records show Harold's parents as George and Sarah Ann Bailey, of 7 Trevor Street, Nechells, Birmingham and his widow, Edith Annie Bailey, of Nechells, Birmingham. It would appear that their marriage was recorded as Harold Bailey = Edith A Humphreys, in the Elham Registration District, Kent (which included Folkstone) in Quarter 2 1917 (Ref 2a 2620).